They can live 15 years or more! Which worms are right for you? There are 100's of species of earthworms, with many different habits. So it is important to make sure you have the right earthworms for your application. The type of worms recommended for use in your Can-O-Worms are Redworms, which are the most common composter worms. Redworms survive best in an organic-rich environment where moisture is maintained throughout the year. Redworms will produce worm manure called castings, or vermicompost, which can be used in your garden as a soil improver. These castings can be added to pots as an additive to potting mixture, around plants as a top dress fertilizer, or as an additive to seed raising mixes. In addition, they can also be used to feed the earthworms found in your garden, which work it well through your garden soil. Abundant Earth is happy to be able to provide this page of commonly asked questions about the Can-O-Worms, with answers gleaned from experts from the field of vermiculture. In this section, you will find answers and hints that will ensure the most efficient use of your Can-O-Worms. What's included with my AbundantEarth.com Can-O-Worms? You will receive a Top Cover, 3 Working Trays, a Collector Tray (bottom), Spigot, 5 Legs and an organic coconut coir brick bedding block. Worms are not included. However, they may be ordered separately. Just click the Add to Cart button below on worm quantity of your choice or click on the Add to Cart button on the Can-O-Worms. Then, on the shopping cart page, choose your worm selection from the drop-down option offered just under the Can-O-Worms. What shouldn't I feed my worms? As mentioned above, it's important that you DO NOT FEED your worms any form of meat or dairy products. Also, take precautions in regards to the items you feed your worms, particularly if you are unaware of its source. Manures for example, from horses, cattle or dogs often have Vermicides still active in it that were designed to kill parasitic worms in the animal. They can kill all your worms in one day. We recommend you allow the manures to age before you use them. In general, we do not recommend using manures from household pets/companion animals. Where can I obtain my compost worms? Right here at AbundantEarth.com. Simply order your worms from the bottom of this web page, or call us at 1-888-51-EARTH to place your order. You may purchase a minimum of 1 pound of Redworms (around 800 to 1200 worms per pound). However, we recommend ordering 2 or more pounds of worms for much speedier results! This depends on how many worms you have. Worms can eat up to half their own body weight every day and can double their population every few months. If you start your Can-O-Worms with 1000 mature worms (identify mature worms by a distinct ring shaped swelling around their body) they will consume up to 1/2 a pound of scraps per day. After a few months you should have 2000 worms and you can feed them more. The baby worms, however, won't eat much and will take about 3 months to mature. As you become familiar with them you will learn their rate of food consumption. How can I help my worms to eat more? Worms will feed at a faster rate once they have adapted to any new food source. Worms will also eat more if kitchen scraps are mashed, blended or food processed. Controlling temperature to around 75 degrees F will improve the overall performance of your system. Worms will leave very acidic food such as onions and orange peels until after they have eaten their preferred foods. A handful of garden lime every few weeks will help to balance the effect of acidic foods. Not usually. Your Can-O-Worms is designed to break down soft organic waste. 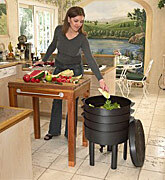 Slow composting organic wastes such as garden refuse are best dealt with by conventional aerobic composting methods. I've had my Can-O-Worms for nearly a month now, but the worms don't seem to be eating? The worms may be eating your bedding material if you have used manure or compost in addition to your Can-O-Worms Bedding Block. If that is the case, the worms will eat through this before eating any introduced food. If just the bedding block is used, the worms should readily eat introduced food waste. Should I add water to the Can-O-Worms? Watering of the Can-O-Worms will enhance the production of liquid fertilizer. Food wastes are about 80% water which is released as the worms break them down. This will tend to stay in the bedding for a long time before eventually draining out. If you pour a bucket of water over the hessian and scraps each week or two, and then place the empty bucket under the open tap, you will have a constant supply of liquid fertilizer. The sudden 'flood' will not harm the worms but will simulate a heavy rain fall. Any dry material such as newspaper or cardboard should be pre-soaked before being added to the Can-O-Worms. It is important to keep a moist hessian bag or wet newspaper over the freshly added food to encourage the worms to move up to feed off the surface. This will provide a dark, damp shelter for them. No, you can never have too many worms. They self-regulate their population to the confines of available space and the amount of food you give them. Worm concentration should reach capacity (about 15,000 to 20,000 worms) after 2 - 5 years. Only if you have a thick surface layer of mulch in your garden. Compost worms require moist conditions all year round because they don't tunnel deep like pasture worms to find moisture. If you cannot provide this environment in your garden, don't introduce compost worms. My "brand new" worms seem unsettled, and are squirming all over the place. Some are even escaping the Can-O-Worms! What's going on? This crazy worm behavior is a normal phenomenon called "worm run." It is fairly normal for the worms to "run" until they get settled in, and it can take about a week for most of them to do this and work their way towards the food. You may have a few dried up escapees when you set up your worm bin, but honestly, they do settle in time. Why aren't the worms moving up from the lower levels into the top working tray? This situation could arise in two ways. First, you may be adding new food too soon before the worms can eat the previous food. This will result in a lot of uneaten food being distributed through the system and a general reluctance by the worms to migrate upwards whilst they can still access food lower in the system. Before adding new trays, stop feeding the worms for at least a week to ensure that all existing food in the lower tray has been eaten. Worms will then move up to consume food from the surface as this is their natural behavior pattern. Secondly, you may not have waited for the level of worm castings to pass the line on the inside of the tray before adding the next tray. This will create a gap preventing the worms from reaching the top trays. Worms will tolerate a wide temperature range from about 50 degrees to 85 degrees F. If it gets much hotter than this, make sure the Can-O-Worms is in a shady cool position. Take the lid off and hose the whole unit down, keeping the bottom drainage tap turned on. If you live in an area that suffers from frosts, put your Can-O-Worms in the warmest possible position, an example being your laundry, garage or shed. If it is on a balcony or in the backyard, then cover the unit with old carpet padding or old blankets to keep some warmth in. Feed them a lot more food waste which will create some warmth as they decompose. It's raining and the worms seem to be gathering in the lid. What do I do? What you are noticing is the worms sensitivity to pressure changes in the weather. They will often go up into the lid even before it rains. In nature, this takes them out of the soil to stop them flooding and drowning. Move the Can-O-Worms out of the rain. Take the worms out of the lid and replace them in the bedding. Are the little white worms in my Can-O-Worms baby earthworms? No, baby earthworms are not white, but clear to opaque, before developing a reddish color. They are just visible at this stage. The 'white worm' you are noticing is a type of worm called entrachyadids. They will not hurt compost worms but they do indicate acidic conditions, which can be overcome by the regular addition of a handful of lime. By placing a piece of moist bread in your Can-O-Worms, you can also lure the white worms to a small area for easy removal. It is important to note that many organisms that may appear in your Can-O-Worms (such as large populations of minute red mites and large soldier fly larvae) are beneficial to the break down of organic material, so there is no need to remove them. How do I keep ants out of my Can-O-Worms? Ants will likely enter your Can-O-Worms if you have a lot of them in your backyard and particularly if you have let the bedding become too dry or acidic. Add water to raise the moisture level and add a liberal quantity of garden lime to where the ants are gathering. This should discourage them. If they persist, remove them physically and smear some Vegelatum (non-petroleum jelly) around the legs or place each leg in a container of water to isolate the system. Will the Can-O-Worms attract flies? No, the Can-O-Worms is fly-proof against household flies. Sometimes the very small vinegar fly (often mistaken for the fruit fly) gets in, but these do no harm. However, very large numbers of the vinegar fly may indicate that you are feeding the Can-O-Worms too much and may be a prelude to problems such as offensive odors. To eradicate vinegar flies, slow your rate of feeding to what the worms will eat on a daily basis. Should you experience any influx of maggots, it will most likely be the soldier fly or vinegar fly larvae. The soldier fly larvae grow up to an inch big starting out white but soon turning dark gray with distinct ribbing bands. Fishermen say they make great bait. The vinegar fly larvae are small, usually 1/4 inch or less. Don't be too alarmed if they appear. They are actually beneficial to the waste breakdown. If you want to remove them though, do so by liberally applying lime, or placing bread soaked in milk on the surface of the compost. Larvae love bread and should infest it. Remove the bread after 2-3 days and dispose of it. The only smell associated with a well maintained Can-O-Worms is a pleasant rainforest odor. If your Can-O-Worms has an offensive smell, it is an indication that anaerobic bacteria have built up in the system in uneaten food wastes. Stop feeding the worms and stir the wastes in the top tray lightly with a garden fork adding lime as well. This aerates the organic material and allows worms to move through it more easily. Repeat this aeration procedure regularly to prevent recurrence. Start feeding again when all smells are gone. Leaving an established Can-O-Worms for 3-4 weeks without constantly adding food is not a problem. Just feed the worms a good quantity of food waste (1/3 of a tray full) before you leave. Make sure that you leave the unit in a cool place under cover and leave the tap open with a container under it. Putting a soaked newspaper on top of your worms will give added protection against their bedding drying out. My worms are in the collector tray...what should I do? There are many reasons why the worms will move down into the Collector Tray. To encourage the worms to return to the First Working Tray a standard ice cream container upside down in the center of the Collector Tray on top of newspaper and covered by newspaper, will provide the worms a path from the Collector Tray preventing the worms from drowning. 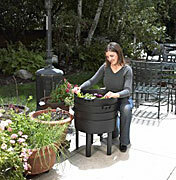 There are two additional products you might consider for an exceptional worm composting experience. These items are not essential. 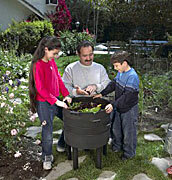 Though, they help create an optimal environment for your composting worms. You may order these products below or as an add-on when you click on the Can-O-Worms Add-to-Cart button below. * Worm Blanket: The Can-O-Worms Worm Blanket encourages efficient worm composting by creating the dark, moist, aerated environment that compost worms thrive in. Made from breathable 100% natural fibres in the ideal thickness to retain moisture. Our Worm Blankets also feature a stitched in handle for easy use. Simply place it over the food scraps in the top working tray. Water the Worm Blanket every time you feed your worms to keep it moist. The Worm Blanket is also a great back up for when you’re on holiday. Your worms will be able to eat it when food scraps are running low! In fact, it's normal for the Worm Blanket to disintegrate over time (rot, mold, etc.) and become food for your wormies! * Worm Compost Conditioner: Worm Compost Conditioner helps neutralize acidity and balance the pH levels in your worm farm or compost bin. This means your worms can digest larger quantities of food waste faster. Worm Compost Conditioner is made from a specially selected blend of natural minerals. When used in your worm compost bins Worm Compost Conditioner helps soil bacteria preserve essential nutrients and increases the availability of nutrients for plants. It also helps reduce odors and pest infestations. Please call 1-888-513-2784 or email sales@abundantearth.com for a shipping quote to Alaska/Hawaii. Typically, shipping/handling to Hawaii is approximately $100+ and to Alaska approximately $125+ for one Can-O-Worms. Comes with a 5 year warranty on materials/workmanship. Please allow approximately 2 - 3 weeks for delivery. 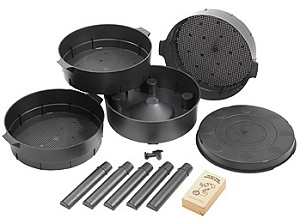 Can-O-Worms 3-Tray Worm Composter $104.95 $98.95 On Sale!